The forecast for energy on Molokai is looking renewable, according to Maui Electric officials. 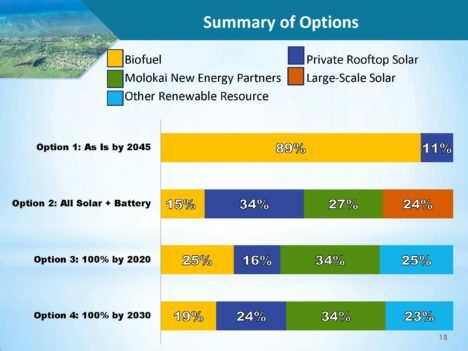 Company officials talked story with residents last week in three sessions around the island about both the company’s and community’s visions for how Molokai can reach 100 percent renewable energy in the near future. A proposal for a large-scale solar project on Molokai is on the table and residents are questioning the project’s benefits and whether community ownership of the project down the road is viable or desirable. 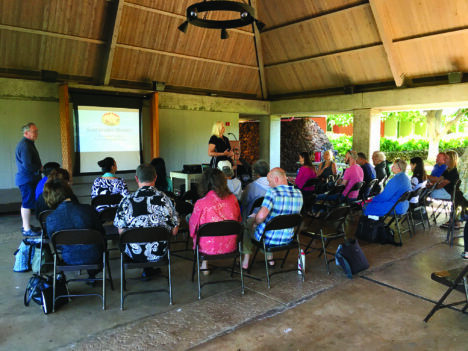 With the island’s energy grid on the brink of change, a group of community energy leaders from around the world visited Molokai last Monday to share their perspectives on renewable energy solutions with residents. Last month, a group of Molokai Middle School students were trained by Maui Electric staff on the Smart Power for Schools Program. This exciting new program, started by Maui Electric in 2015, allows students to view energy usage in real time at Molokai Middle School and other public schools across the state. Students can look at the peak times that their school uses energy during the day and compare the energy usage with other schools. Using the Power Scope Meter, they are able to determine when power spikes occur to develop energy conservation practices. A utility-scale renewable energy project pitched to Molokai residents a couple weeks ago could help to stabilize a portion of their electric bills while significantly reducing the island’s reliance on fossil fuel. Additionally, a revised plan now includes the potential for a local nonprofit to purchase the plant after a few years. Molokai’s Hui Up! program is now in full swing as families last week began trading in their older, energy-eating refrigerator units for new, low-cost ENERGY STAR®-certified models. Hawaii Energy supported the nonprofit organization Sust`aina ble Molokai in implementing the transformation and educational refrigerator exchange program, with generous help from Makoa Trucking Service, Servco Home and Appliance Distribution, and General Electric.